Herb Carnegie (1919-2012) is one of the greatest hockey players never to play in the National Hockey League. He was the son of Jamaican parents and grew up practising his hockey skills on icy ponds in Toronto. Carnegie was noticed at the age of 18 by Conn Smythe, the owner of the Toronto Maple Leafs. It was said that Smythe would have considered signing Carnegie if it were not for the race barrier that existed then in professional hockey. Carnegie continued to pursue his dreams elsewhere, moving to northern Ontario in the 1940s. 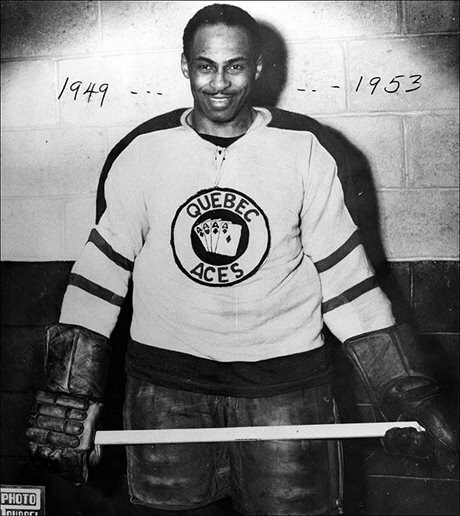 Playing alongside his brother Ossie, and Manny McIntyre, the three made up the first all-Black line in semi-professional hockey. The trio became known as the Black Aces, and played in the Quebec Provincial League. Carnegie retired from playing hockey in 1954. The following year, he started the Future Aces Hockey School. In 1987, he established the Herbert H. Carnegie Future Aces Foundation that provides scholarships to deserving youth. Learn more about the Herbert H. Carnegie Future Aces Foundation on their website.